Yvette Gavin Kicks Off The Official ReCalibrate City Book Tour. 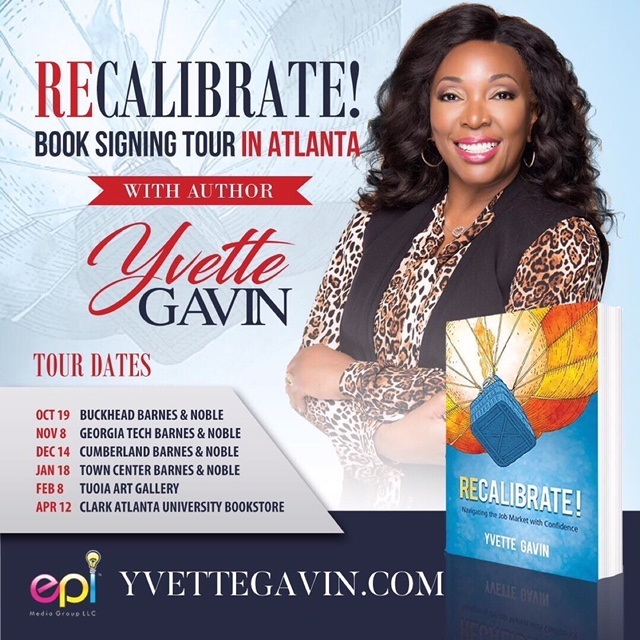 Atlanta, GA (October 12, 2017 ) On October 19, 2017 inspirational speaker, author and elite business strategist, Yvette Gavin, will kick off the official “ReCalibrate” city book tour. The six city book tour begins at 7:00 p.m. at Buckhead’s upscale The Peach Shopping Center Barnes and Noble, located at 2900 Peachtree Rd NW #310, Atlanta, GA 30305. During each stop Gavin will autograph books for each of her supporters and share her secrets of coaching individuals into higher paying jobs, more rewarding careers, and personal spiritual growth. Gavin has helped Fortune 100 companies and small businesses improve the quality of their deliverables and build strong and highly productive teams. She has proven herself as an expert in growing small and large companies and navigating careers across changing landscapes, which she displays in her book ReCalibrate! Navigating The Job Market With Confidence (ReCalibrate). ReCalibrate! is a roadmap packed with a wealth of information on conducting an effective job search, making the most of the job you have, and how to gain clarity on the best career path. ReCalibrate! simplifies the process of recruiting and hiring as well as assists individuals in securing their dream job. Gavin’s goal is to help others achieve their highest potential in their business, spiritual, and personal life. Remaining consistent with her deep conviction and passion to help others grow, Gavin will soon be announcing her multi-city tour stops across the nation and sharing her proven roadmap to a successful career. Her goal is to educate, inspire and empower. For more information about Yvette Gavin visit www.YvetteGavin.com. For all inquiries contact PRTeam@epimediagroup.com. Yvette Gavin is an elite business development strategist, certified trainer and speaker and the founder of Yvette Gavin Consulting, LLC. She is notably known for her work with the United States Government, her facilitation of relationship workshops for the U.S. Consulate in Brazil and The Georgia National Guard, as well as her overall ability to build thriving workplaces through dynamic training programs. Yvette is known for her ability to build high-performing Information Technology (IT) teams that deliver exceptional quality. She has held progressive leadership roles at Lockheed-Martin Aeronautical, Delta Air Lines, AT&T, Cbeyond and Cox Communications. Yvette has proven herself as an expert in growing small and large companies and navigating careers across changing landscapes which she proves in her book Recalibrate! Navigating The Job Market With Confidence. In addition to being a respected business strategist, Yvette is also a former reporter for the Atlanta Journal Constitution (AJC) and the Birmingham News as well as a CNN Headline News (HLN) editor and manager of the Southeastern Bureau. She is an accomplished author , a certified Prevention and Relationship Enhancement Program (PREP) facilitator; a certified life coach from the International Christian Coaching Association (ICCA); and a Joe Beam Family Dynamics certified facilitator. In addition to writing Recalibrate! Navigating The Job Market With Confidence, she also authored What to Do After You Say I Do, combining her passion and experience of building thriving workplace and personal relationships. As a relationship expert Yvette has spoken at multiple conferences and appeared on numerous radio and television programs as an advisor. Additionally, The Georgia National Guard Chaplaincy Corp bestowed upon Yvette the Exemplary Performance Award while serving as an instructor for the Strong Bonds Marriage Conference. Her goal is to help others achieve their highest potential in their business, spiritual, and personal life. Yvette’s career and life’s work covers a broad spectrum of successes that speaks highly of her talent and commitment to excellence. Remaining consistent with her deep conviction and passion to help others grow; Gavin is currently accepting opportunities as a keynote speaker for female empowerment and inspirational conferences. Her goal with every speaking opportunity is to educate, inspire and empower. For more information about Yvette Gavin visit www.YvetteGavin.com. For all inquiries contact PRTeam@epimediagroup.com.